The Alberta Wetland policy recognizes Alberta wetlands vary in form, function, use, and location and therefore are not equal in value. The new policy has developed a system to determine the relative value of a wetland. Relative wetland value is determined by examining 5 characteristics: the relative abundance of a wetland on a landscape, human uses of the landscape, the ability of the wetland to improve water quality, the hydrologic function of the wetland, and the ability of the wetland to support biodiversity. 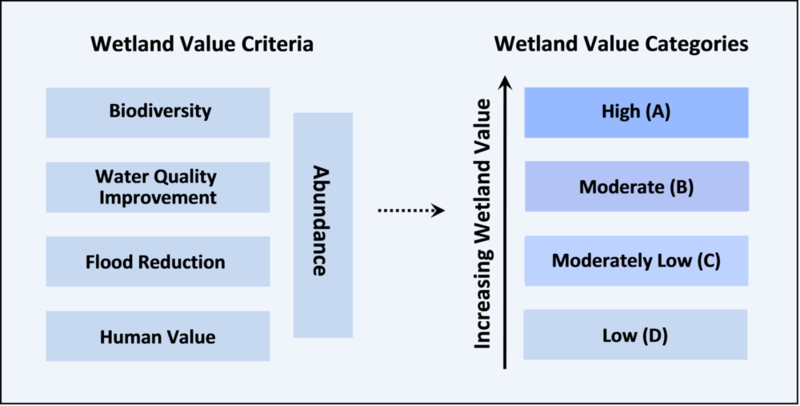 Once these values have been assessed the wetland is assigned a value category from A (highest value) to D (lowest value). Determining the relative value of a wetland will allow land use planners, developers, and decision makers to consider the wetland in the context of the landscape and adapt strategic and informed wetland management decisions. AP’s (Authenticating Professionals) will be responsible for assessing relative wetland value using ABWRET (Alberta Wetland Rapid Evaluation Tool).